Do you want your children to enjoy a game of Paintball for children in Madrid? 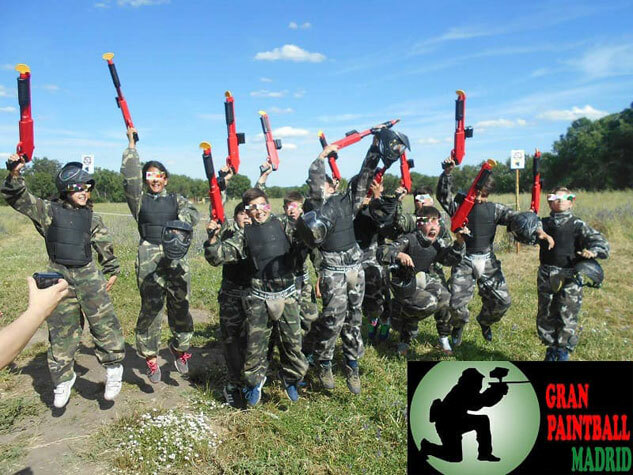 At Gran Paintball Madrid we have equipment specifically adapted for boys and girls between 8 and 13 years old!! The Royal Decree 137/1993 of Regulation of Intervention of weapons forbids to play Paintball with professional weapons of compressed air to the minors of 14 years. Therefore, if your son or daughter wants to play the best shooting game for children, they must do so in the fields that we have Paintball specially adapted for these ages. This type of children’s Paintball is very similar to that made by adults, as they are equipped with camouflage suits with neck protection, gloves, and are provided with protective vests (both girls and boys) so that they feel like in the games made for adults. We also give them our special anti-fogging double lens masks, so the only difference they’ll really notice from boys and girls over the age of 14 is the marker (the gun) they’ll use. These markers weigh much less than the ones for adults and throw slightly smaller balls of biodegradable, non-toxic paint. Although they don’t use compressed air, you’ll be amazed at the precision they have, making kids feel like in the middle of a battle, spend an unparalleled day, and improve interpersonal relationships with their friends by learning to work as a team! These children’s weapons have built-in 50 ball chargers, so when they run out of balls, we just have to fill the charger to continue playing. They use the same 9 stages with Forests, Fort, Airplanes, Battle tanks, Towers, tank, bus, boats and others that the older participants use, so the fun is assured. Bring your child to try Children’s Paintball for the little ones and you’ll see how he or she enjoys the thrill of the game! INCLUDES: Professional double lens anti-fogging mask – Military camouflage coverall with neck protector, green or gray depending on the equipment to which it belongs (children’s size) – Protective vest for both boys and girls – Marker JT Splatmaster and Valken Gotcha caliber 50 with charger – Gloves – 100 Balls – Civil Liability Insurance and Accident Insurance. Want to play children’s Paintball without worrying about the balls you use? With this offer you will have unlimited balls for 60 minutes to enjoy an hour of game without thinking about ammunition! You’ll play with: High-end mask with double anti-fog lens – Military suit with neck protector included, green or grey camouflage depending on the equipment to which it belongs (children’s size) – Protective bib (for both boys and girls) – Markers models JT Splatmaster and Valken Gotcha 50 caliber – Gloves – Unlimited balls for 60 minutes.Civil Liability Insurance and Accident Insurance. If you love Paintball and want to enjoy it to the full without worrying about how much you shoot, this is your package: With this offer you will have unlimited balls for 90 minutes! In addition, as in all our offers, having at least one instructor only for your group, recharges are made very fast, so the game time will be real. You will play with the best material that exists today: Mask with double anti-fog lens of different color depending on the team – Military camouflage suits with neck protector (special size children) – Protective vests (for both boys and girls) – Markers Valken Gotcha caliber 50 – Gloves – Unlimited balls for 90 minutes – Civil Liability Insurance and Accident Insurance. Also remember that if there are 12 or more children, one child plays for FREE (discount of 15€, 18€ or 20€ depending on the package chosen), and would only have to pay for the additional reloads (in case you use additional reloads)! When the children arrive at our facility, we explain the safety rules to them carefully. Until it is clear that they must always comply with the most important rule of children’s Paintball, which is never remove the mask, the game does not begin. We have professional instructors with years of experience in both Paintball and outdoor activities, whose number one priority is to ensure the safety of the game. We place a lot of emphasis on this point as younger boys sometimes act in a more unpredictable way. For this reason, they will always be accompanied by instructors who will ensure that the game runs smoothly at all times. Safety at Gran Paintball Madrid is essential. If you want the little ones to spend an unforgettable day playing Paintball for children in Madrid, don’t hesitate to bring them to our facilities. Our unique outfits, our obsession with exceptional customer service, and the huge venues in which you will play, will make you enjoy a day you will always remember. We have 9 stages in the middle of nature, in a land protected by its high landscape and ecological value, with different fields that include huge forests of ash trees, Indian tipies, a fortress of wood, a watchtower, tanks, airplane, helicopter, bus, and so on. Paintball encourages teamwork among children, group cohesion, and will perform a healthy and fun sport in the middle of nature. 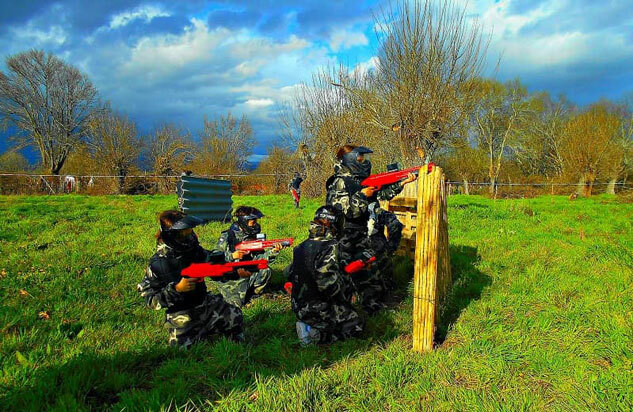 Remember, the best Paintball for kids is played at Gran Paintball Madrid! Play the best children’s Paintball, specifically adapted for boys and girls from 8 to 13 years old. Enjoy 75-90 minutes of fun gymkhanas in the middle of nature, where your children will race with giant sacs, egg throwing competitions, teamwork tests, blind tastings, water balloon tests, etc. All these tests have one thing in common: the children won’t stop laughing! Enjoy our famous barbecue, hamburgers, sandwiches, or cake if it is the birthday of a little one (for this you just have to let us know beforehand). So don’t forget that if you’re looking for children’s activities in Madrid, we’ll prepare a day to remember! Children’s Paintball is the ideal activity to celebrate children’s birthdays, as it is the perfect occasion to meet with friends and perform a different activity, healthy, and above all fun! Our experience tells us that when a child celebrates his birthday with us, all his friends want to celebrate it again in our facilities. The mothers tell us that the children hardly sleep the night before, and that they sleep like babies after the activity. Come and celebrate your son’s or daughter’s birthday at Gran Paintball Madrid, success is guaranteed! We have observed that children between 10 and 12 years old are the ones who most enjoy Paintball for children. Thirteen-year-olds have a great time, but they always ask us about the professional equipment they will be able to use the following year, when they turn 14. So if you want to celebrate the birthdays of your 10 year old, 11 year old, or 12 year old children, know that they are in the ideal age to start practicing this healthy and fun sport, which we are sure will hook them.